Leanna Stockard is an Associate Licensed Marriage and Family Therapist providing individual and family therapy to all ages, as well as couple therapy. Using a systemic approach, she specializes in the treatment of anxiety, depression, life transitions, stress management, substance abuse, family conflict, parenting, and multi-cultural issues. Leanna provides a nonjudgmental and compassionate therapeutic environment to her clients. She believes that we are the experts of our own lives and works together with her clients to discover their strengths and create effective change. Leanna focuses on understanding her client’s environment and lifestyle to improve their relationships with themselves and their surroundings. 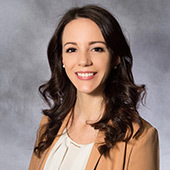 Leanna graduated with a Bachelor of Science degree from Adrian College, and a Master’s Degree in Couple and Family Therapy from Adler School of Professional Psychology. Her clinical internship was completed at a community mental health organization, Youth Services in Buffalo Grove, where, in addition to conducting individual and family therapy, Leanna facilitated several groups focusing on female empowerment, substance abuse, healthy decision-making, and stress management.